Video interviews, panel discussions, articles and Q&As featuring Monte Cahn. We’re joined by Andrew Rosener, Monte Cahn and Shane Cultra. In his first interview since selling his portfolio, Michael Berkens answered some questions about the the WorldWide Media domain name portfolio mega-sale to GoDaddy. I asked him how much he sold his portfolio for, what he bought as a result of the sale, and what’s next for him. Also, Berkens and Monte Cahn discuss the $24 million dollars worth of domain names that are going up for auction at the NamesCon conference in January 2016. Want some insider information on which domains will have no reserve, be the best value, or will have the highest resale potential? This is the show to watch! 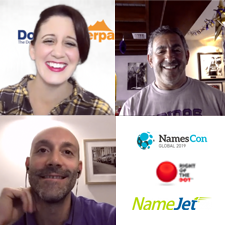 Whether you’re attending the NamesCon domain name auction in person, watching via the live web feed, or bidding by telephone, this show will walk you through domain names that you might have missed – presenting opportunities for either undervalued or no-reserve purchases. This show also contains tactics for understanding and successfully navigating most live domain name auctions that may occur at a future date, so don’t disregard watching this interview just because you missed the auction on Tuesday, January 13, 2015. Last week, the T.R.A.F.F.I.C. Domain Conference & Expo took place in Fort Lauderdale, Florida. Top domain investors from around the world converged at the Ritz Carlton for five days of networking, sharing, learning, partying and dealmaking. Here are five lessons learned that you can use to grow your business that I gleaned from this conference. If you attended the conference and learned a lesson or two that is not covered here, please let us know about it in the comments.